Now on a more powerful server! This site is dedicated to owners that want to get more out of their Robosapien V2, Roboraptor, Robopet, or original Robosapien robot. Here you will find detailed hacks and modifications from the simple to the kind that will definitely void your warranty (but impress the hell out of your friends and family). If you are looking for technical support or want to chat with other robot owners, visit our WowWee forum. We are a collection of hardware hackers and software programmers that are devoted to modifying and improving the functionality of Mark Tilden�s line of robotic toys. Looking to buy Pleo or for more information on the Pleo Dinosaur? Follow the link to see our upcoming portal for the little green baby dinosaur robot. Browse our list of participating expert robosapien software and hardware hackers. If you want to become an expert yourself, use the Contact Us link below. The latest insider information on the new Roboraptor dinosaur robot from WowWee Toy�s. Join our forum and share software & hardware ideas, tips, tricks for modifying or getting more out of your Robosapien. Chat with our experts. This is is also the user support forum for the Robosapien Dance Machine; the free open source software program that is the most powerful Script Editor & programming tool on earth for the Robosapien robot. External Experts - other people and places where you can find helpful robot advice. Friends Of The Site - people that have been helpful EvoSapien in different eays. NEWS UPDATE (07-24-2007): Robosapien V2 4mem8 joins the Evosapien Team! Robosapien V2 4mem8 dedicates himself to providing detailed technical overviews of WowWee�s robots and creative mods, like his Roboquad pictorial and his Robosapien V2 wheel base project. NEWS UPDATE (02-17-2006): Jamie Samans joins the Evosapien Team! Jamie Samans author of the popular Robosapien guide book, �The Robosapien Companion: Tips, Tricks, and Hacks�, has joined the team. He is one of the first hackers ever to add a wireless camera to the original Robosapien robot. NEWS UPDATE (02-16-2006): Robotech joins the Evosapien Team! Robotech known for his warranty friendly LED hack that adds a Robosapien V2 vision enhancement lighting solution that does not involve invasive surgery on your robot. NEWS UPDATE (02-15-2006): Marcus joins the Evosapien Team! Marcus is an avid Robosapien V2 modder and recently released a hack that mounts an MP3 player for portable robot tunes. NEWS UPDATE (02-01-2006): PCPhobic joins the Evosapien Team! PCPhobic is a frequent contributor of mod tutorials, pictures, and videos. Check out his superbly illustrated LED mod that virtually eliminates the Robosapien V2�s vision recognition problems in low light conditions. NEWS UPDATE (01-14-2006): Machine vision and learning expert BinaryAngel joins the Evosapien Team! You can download BinaryAngel�s machine vision software and experiment with it right now! NEWS UPDATE (12-31-2005): Nocturnal, the Robosapien V2 guru, joins the Evosapien Team! Nocturnal, is reknowned for his extensive Robosapien V2 Hacker�s guide; which includes pin-outs and diagrams of all the key parts and electronics in the Robosapien V2. A must-see for anyone that intends to modify the Robosapien V2! 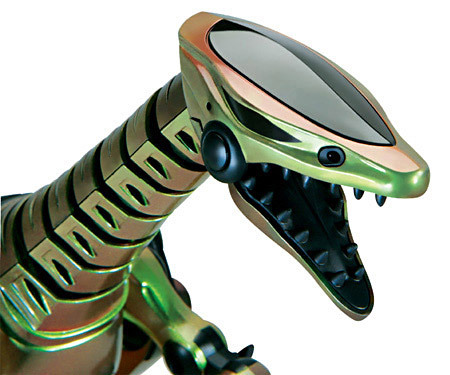 NEWS UPDATE (12-21-2005): Sprocket2Cog, Roboraptor Hacker Extraordinaire joins the Evosapien Team! Sprocket2Cog is well known for his cool Roboraptor mods and hacks; he even has a Mini Roboraptor Hack! Visit his site section now. Ace Robosapien modder Chance has been hard at work accumulating photos, movies, and insider tips on the Robosapien V2. Senior editor Robert Oschler has a good write-up of the new features and specs of the Robosapien V2. HOT OFF THE PRESSES! - See the Voice Controlled Robopet Video Now! Chance Brown has done it again! See a poor robot beg for batteries! See a vicious kitty fight between Robosapien and Chance�s merciless cat! Truly funny Robosapien Robot movie. Expert Hacker Chance Brown has created a terrific video showing off his Robosapien wireless camera and infrared link modification. Check this out now!